The mini downhill series is now in it’s 10th year. On a bright sunny morning in March on a dry dusty track the team joined 19 other women entered across 4 race categories, here’s Kate’s race report. 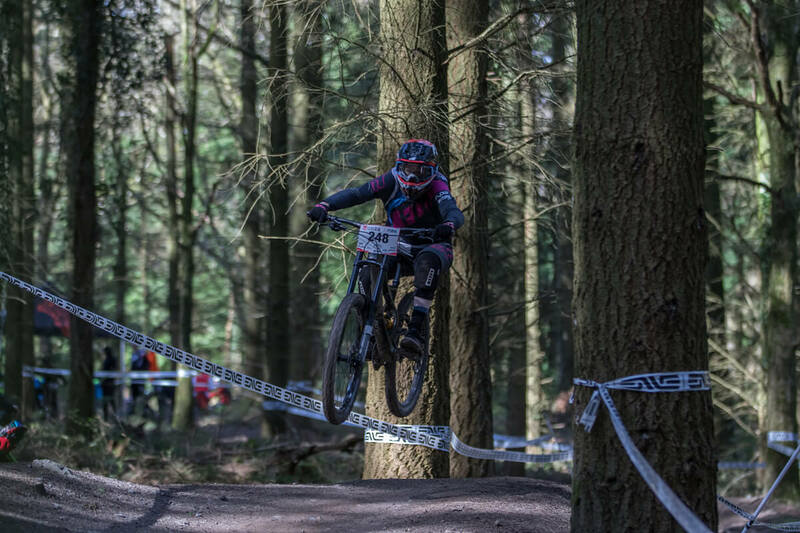 Waking up to the sound of tweeting birds and nice warm rays creeping through the blinds in my van, I remember it’s race day, the last of the Onza Mini Downhill Winter series in the Forest of Dean and what a corker of a track we get to compete down- the Corkscrew! I think all the racers felt just as blessed as me. Blue skies, blistering fast dusty track, music, excitable buzz and smiles all round, what more could we want on race day ?! Corkscrew is a cracker of a track with the top section like a playground, pedalling hard popping over some roots you’re soon hitting the first jump straight into a tight left hand berm down into a drop, twisting, turning and charging over humps and a small double step down, taking the high line over some roots into a tight right hand berm, that’s finished with a nice rock drop. The terrain then gets steeper over a few slab and root drops onto the mid point fire road. This is where the track gets super fast and gnarly, it puts a right grin on your chops! Crossing the fire road looking ahead you feel blind dropping into the next section, with ruts, roots, tree stumps and a sudden step down, you fast approach a nice rooty drop off before an ‘S’ bend heading into the home straight. With more ruts and roots thrown at you for good measure, keeping it pinned on the inside line over a small bank to the finish is a great feeling! After a snack and a few threats from Rebecca (pretty sure she laced a sweet she gave me with some kind of tranquelizer) we were back at the start line. I set off on my run and was going well until I hit that final berm and rock drop, again, loosing all my speed. I’m not sure how this is happening as in practice I held a nice smooth speed. Again I cranked away and focused on the rest of the track, nearly turning too early into the last bend (that would have been embarrassing) I was on the home straight and crossing that finish line. No sooner had I taken my lid off and placed my bike down Rebecca was storming over the last bend and crossing the line too – wow that must have been quick! I managed to scrub off a second and Rebecca came in at 1:3 to grab that well deserved 4th place with a stonking second run. I’m still buzzing about this race as I write this – what a banger of a day. Thank you to Flow, my teammates, all the rest of the girls and racers and the event crew and marshall’s. I can’t wait for the first race of the next series! I’m hoping to take part in the summer series at the Forest of Dean. I’ve really enjoyed my first races and everyone have been so welcoming. If you want to have a bash at racing this series it definitely has the thumbs up from me. Thank you for the photo SpawnAgain !